Have some great news! 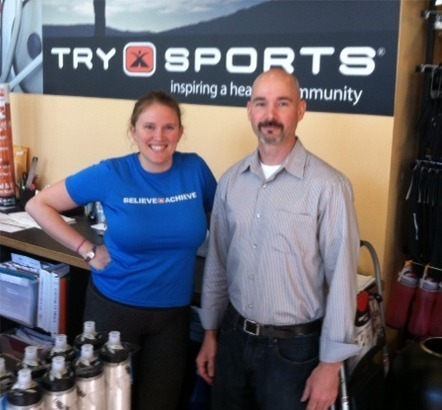 For those of you that know me, back in 2008 I became part of the TrySports ambassador program. This was a great relationship and I really felt as if I became part of family. All of the staff at TrySports became good friends as did the other ambassadors. I remained sponsored by them over the next 3 years or so and life was good. Well, the great news is that I am back in the family and once again part of the TrySports team of ambassadors. Those of you not familiar with the company, TrySports, unlike some other specialty running or triathlon stores, don’t just cater to experienced athletes. I’ve been in some of those stores and I’ve seen beginners get looked down upon when they didn’t know the terminology or may have simple questions since they’re just starting out. Instead, at TrySports, they foster an environment welcoming beginner and experienced athletes alike. Their mission is to “inspire their members to stay fit and healthy and enjoy the aerobic activities of walking, running, swimming, cycling, fitness, yoga and triathlon.” In my experience, they do just that. No matter what your current fitness goals are, they aim to help you in achieving them, and assist you as you develop new ones once you’ve succeeded. Check out this awesome video to get a quick snapshot of what you’ll experience in their stores or hit up their website at http://www.TrySports.com. We’ll be doing lots of good stuff together in the form of clinics, group rides/runs and more, so stay tuned!